I am so in love with these cupcakes. They are so moist and delicious, who does not love banana split sundae, the simple vanilla ice cream drenched in chocolate sauce and topped with whipped cream and crunchy nuts absolutely a-ma-zing! 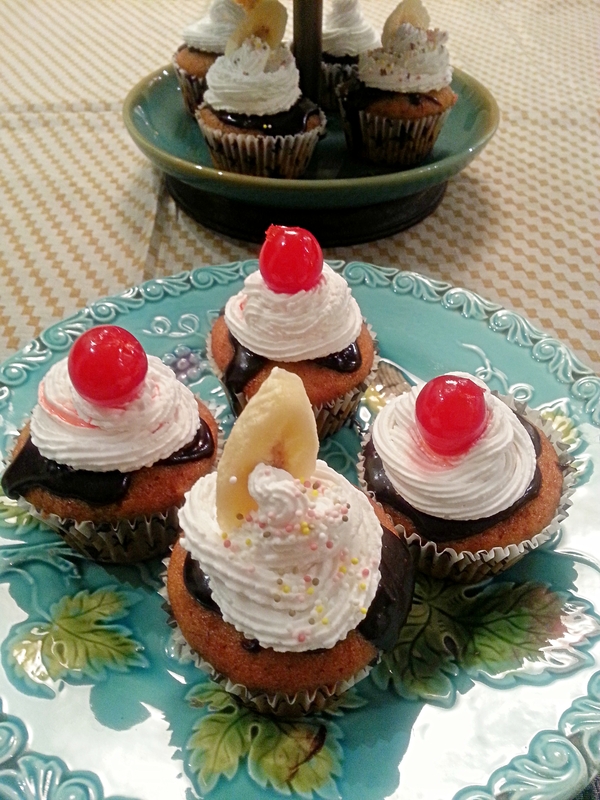 and yes the chocolate and banana combination has always been classic, all in all these cupcakes are winners, i don’t know anybody from any age bracket who does not love these. The cupcakes are wonderful topped with maraschino cherries or with fresh banana slices, feel free to throw anything on it anything that you would want your banana split to have, add sprinkles, nuts of your choice enjoy creating your own personalised little cupcake. My pictures don’t do justice to these delicious cupcakes as i am a bad photographer but please do bear with me i am learning and i hope to get better at both icing and photography. Preheat the oven to a 180 degree centigrade. In a bowl combine flour, baking powder, baking soda and salt and set aside. In another small bowl mix mashed bananas with lemon juice and set aside. In a large bowl, using an electric mixer cream together butter and sugar until light and fluffy about 3-4 minutes, mix in the egg and vanilla extract, add your mashed bananas and stir until combine. Now mix in the flour mixture alternating with buttermilk . Pour mixture into greased muffin cups or paper muffin cups, bake for 20-25 minutes or until toothpick inserted in the centre comes out clean. Remove from the oven and let muffins cool in the muffin pan for 10 minutes then remove from the muffin pan let them cool completely on a wire rack for at least half an hour. Meanwhile for the ganache, place chocolate chips in a medium bowl and in a small saucepan heat your cream over medium heat bringing just to a boil. Remove from heat and pour over the chocolate chips and whisk until smooth. Allow ganache to cool slightly before pouring it on the cupcakes. Pour about half tablespoon full of ganache over each cupcake let it sit there for a while until its completely cool. Meanwhile , in a large bowl with an electric mixer whip the whipping cream until soft peaks form, stir in the powdered sugar and vanilla and whip until stiff peaks form. Just before serving pipe sweetened whipped cream over cooled chocolate covered cupcakes and sprinkle with your favourite stuff. 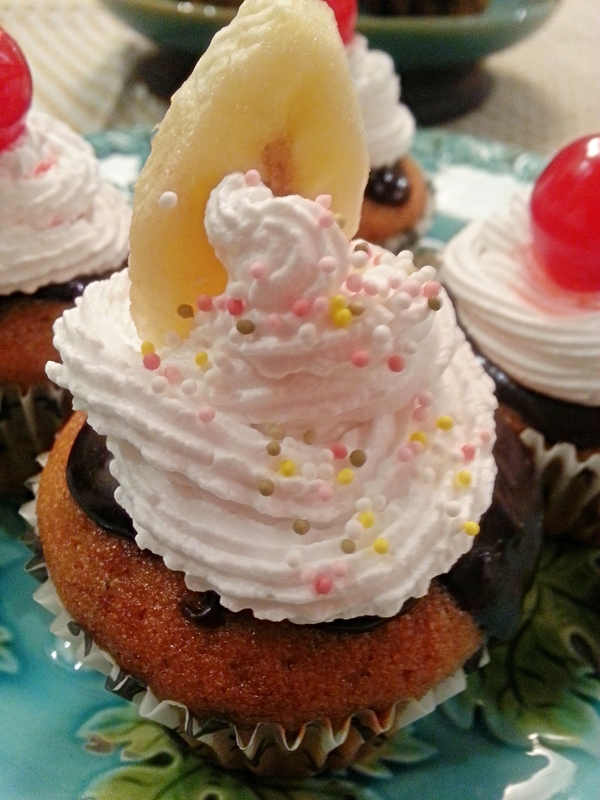 Garnish each cupcake with maraschino cherry or fresh banana slice. Store cupcakes in the refrigerator. Its a cooking classy recipe. oh boy the cakes you make are always so delightful. Thanks for sharing!